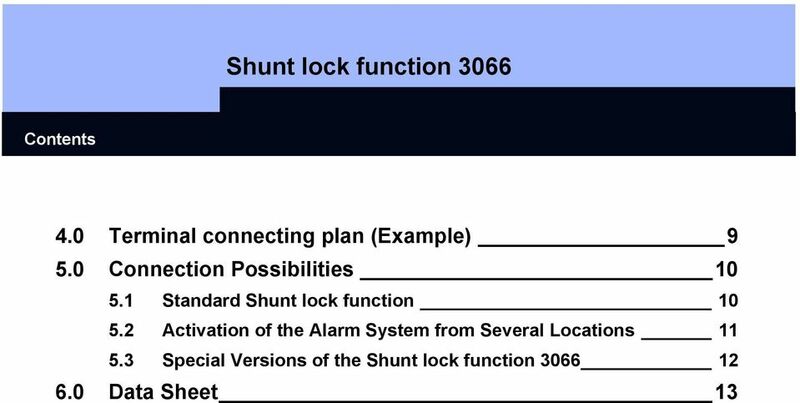 Download "Shunt lock function 3066"
4 Page Method of Operation 1.1 General When using the digital locking system in an object that is secured by alarm, one condition that is to be met is that when the alarm system has been activated, an accidental entry of the area is not possible. This can be realized by using our shunt lock components. These consist of an activation unit and a deactivation unit. 1. The activation unit is for switching the alarm system. In the locking plan, the authorizations for turning the system on and are granted by mouse click. 2. The deactivation unit sees to it that a door of the securing area cannot be accidentally opened with an authorized transponder when the alarm system has been activated; it thereby avoids false alarms. It is equipped with an LED that signals the status activated-deactivated. 1.2 Turning the Alarm System On The one authorized to do the switching activates his or her transponder near the activation unit. This sends a signal to all available deactivation units. If the doors are equipped with lock contacts, the deactivation units verify that the doors are correctly locked. Only when this is the case are the digital locking cylinders or Smart Relays deactivated so that an entry into the securing area is no longer possible. The deactivation unit s LED is extinguished. The activation unit activates the alarm system via a floating contact after the successful deactivation of the locking cylinders or Smart Relays. 1.3 Turning the Alarm System Off The one authorized to do the switching again activates his or her transponder within the transmitting range of the activation unit. The deactivation units signalize this to the digital locking cylinders or to the digital Smart Relays. The doors can now be accessed again with all authorized transponders. The deactivation unit s LED lights again. 1.4 Activation Transponder In case of an emergency, you can use the locking plan software to program a transponder that removes the deactivation of the locking cylinder so that the doors can be opened with an authorized transponder. The alarm system remains activated, however, and the alarm is triggered. 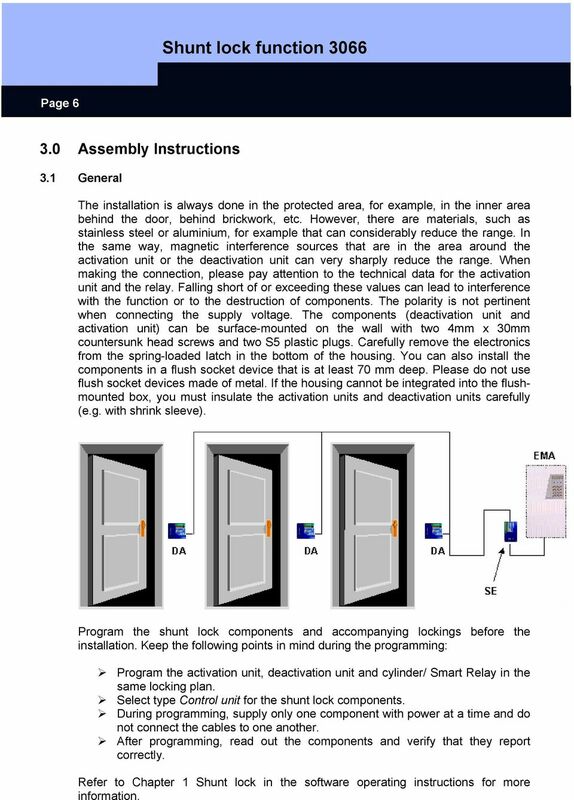 6 Page Assembly Instructions 3.1 General The installation is always done in the protected area, for example, in the inner area behind the door, behind brickwork, etc. However, there are materials, such as stainless steel or aluminium, for example that can considerably reduce the range. In the same way, magnetic interference sources that are in the area around the activation unit or the deactivation unit can very sharply reduce the range. When making the connection, please pay attention to the technical data for the activation unit and the relay. Falling short of or exceeding these values can lead to interference with the function or to the destruction of components. The polarity is not pertinent when connecting the supply voltage. The components (deactivation unit and activation unit) can be surface-mounted on the wall with two 4mm x 30mm countersunk head screws and two S5 plastic plugs. Carefully remove the electronics from the spring-loaded latch in the bottom of the housing. You can also install the components in a flush socket device that is at least 70 mm deep. Please do not use flush socket devices made of metal. If the housing cannot be integrated into the flushmounted box, you must insulate the activation units and deactivation units carefully (e.g. with shrink sleeve). Program the shunt lock components and accompanying lockings before the installation. Keep the following points in mind during the programming: Program the activation unit, deactivation unit and cylinder/ Smart Relay in the same locking plan. Select type Control unit for the shunt lock components. During programming, supply only one component with power at a time and do not connect the cables to one another. After programming, read out the components and verify that they report correctly. 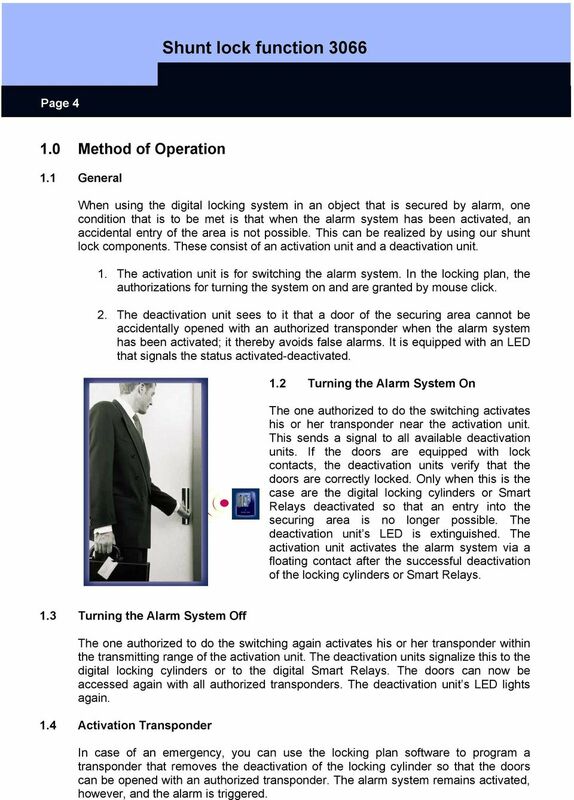 Refer to Chapter 1 Shunt lock in the software operating instructions for more information. 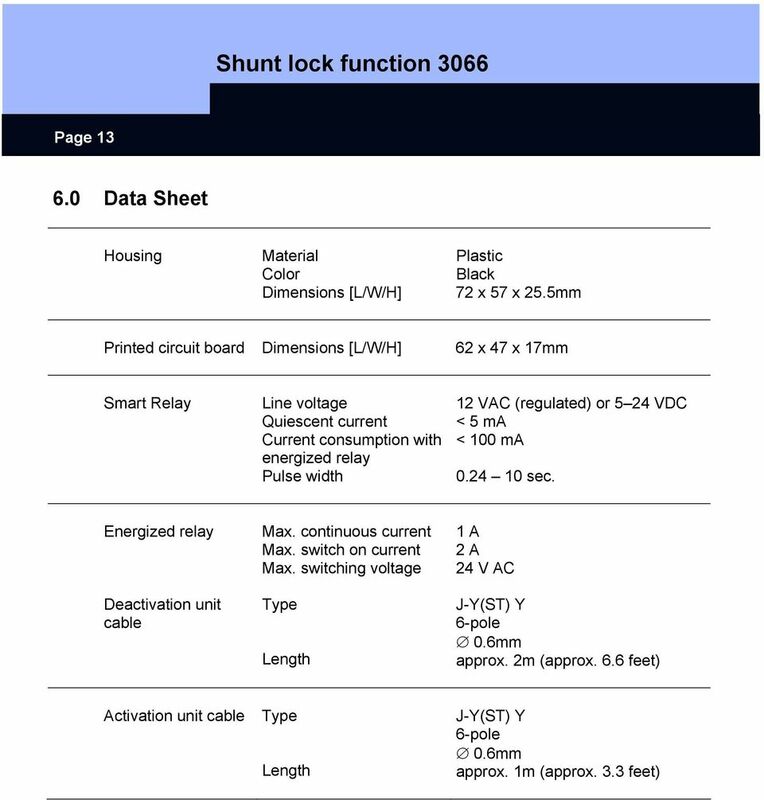 7 Page Locking Cylinder/ Smart Relay Install the digital locking (Smart Relay or locking cylinder) that should be deactivated by the shunt lock function. 3.3 Deactivation Unit (DA) Before permanently installing the components, check the radio transmission to the digital locking. To do this, connect the deactivation unit to the supply voltage (9-volt compound battery) and position the unit within radio range of the digital locking. Deactivation unit Digital Locking Cylinder Deactivation unit Digital Smart Relay 20 cm to 40 cm (8 to 16 inches) 50 cm to 1 m (20 to 40 inches) The ranges depend on the structural circumstances and so will vary. Connect the red line with the blue one. The cylinder or Smart Relay is deactivated (signal tone for cylinder) and the LED on the deactivation unit goes out. When you remove the connection, the cylinder or Smart Relay is activated. The LED lights again. Repeat the tests several times until the radio link works perfectly. Then install the deactivation unit. You can increase the range between the cylinder and deactivation unit by using FH version locking cylinders. Install the other deactivation units, if any, and conduct a series of test on all deactivation units. 3.4 Activation Unit (AU) Before installing, apply voltage to the activation unit and test whether its relay switches. Install the components in the door area, making sure that the distance to the digital locking is at least 1 m (40 inches). If the distance is less, turn the activation unit by 90 degrees so that the AU antennas are aligned horizontally. If it is required, you can move the activation unit LED to the outside area so that you can tell whether the alarm system is turned on or off even from outside. You must allow a distance of at least 3 m (approximately 10 feet) from other deactivation units if you are installing activation units that are not directly connected to a deactivation unit but that are in the same locking plan. Connect the white, blue, red and green cables of the activation unit and the deactivation unit(s) to one another (see connecting plan on page B7). Do not connect the yellow lines with one another. It is absolutely important that you do not connect the blue line with one of the white lines, because otherwise the electronics will be damaged. If the lines are not long enough, feel free to lengthen them. Recommended cable type: J-Y(ST)Y 6-pole Ø 0.6mm. 8 Page 8 Apply supply voltage to terminals 1 and 2 on the activation unit. The polarity of the supply voltage does not matter. Check whether there is a minimum voltage of 9 volts on the deactivation units (voltage drop from the cable). Perform a function test by operating the activation unit with an authorized activation unit. 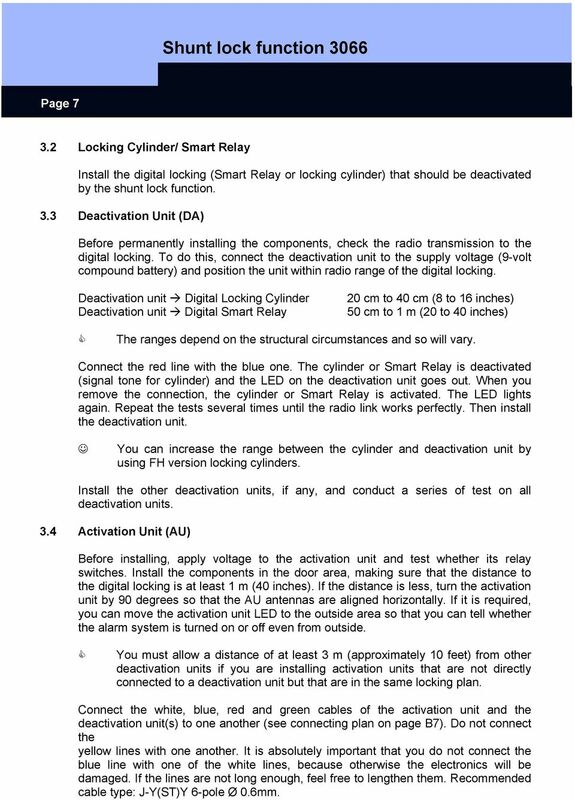 The light emitting diodes on the activation unit and the deactivation unit(s) go out and the cylinder(s) or Smart Relay(s) must be deactivated. When you activate the components, the LEDs light again. 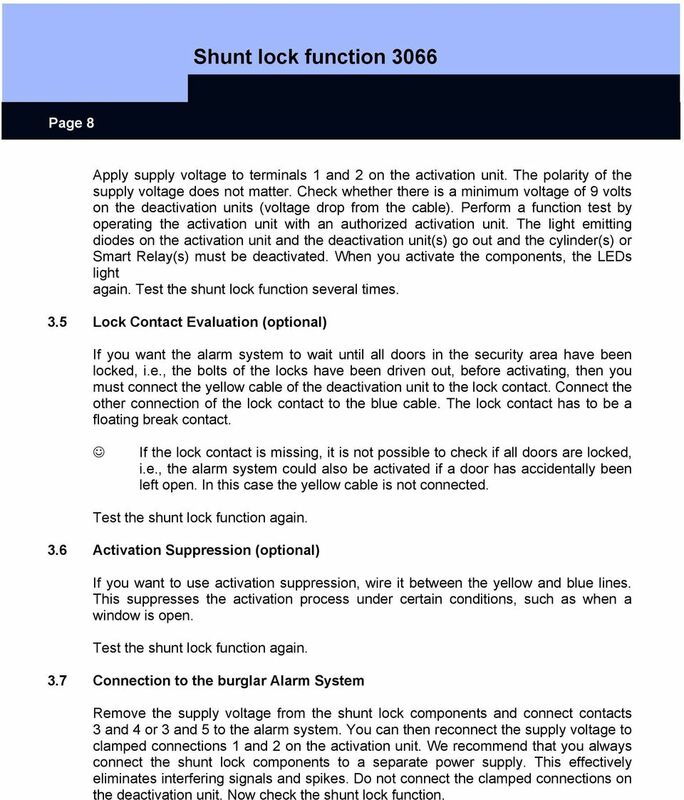 Test the shunt lock function several times. 3.5 Lock Contact Evaluation (optional) If you want the alarm system to wait until all doors in the security area have been locked, i.e., the bolts of the locks have been driven out, before activating, then you must connect the yellow cable of the deactivation unit to the lock contact. Connect the other connection of the lock contact to the blue cable. The lock contact has to be a floating break contact. If the lock contact is missing, it is not possible to check if all doors are locked, i.e., the alarm system could also be activated if a door has accidentally been left open. In this case the yellow cable is not connected. Test the shunt lock function again. 3.6 Activation Suppression (optional) If you want to use activation suppression, wire it between the yellow and blue lines. This suppresses the activation process under certain conditions, such as when a window is open. Test the shunt lock function again. 3.7 Connection to the burglar Alarm System Remove the supply voltage from the shunt lock components and connect contacts 3 and 4 or 3 and 5 to the alarm system. You can then reconnect the supply voltage to clamped connections 1 and 2 on the activation unit. We recommend that you always connect the shunt lock components to a separate power supply. This effectively eliminates interfering signals and spikes. Do not connect the clamped connections on the deactivation unit. Now check the shunt lock function. 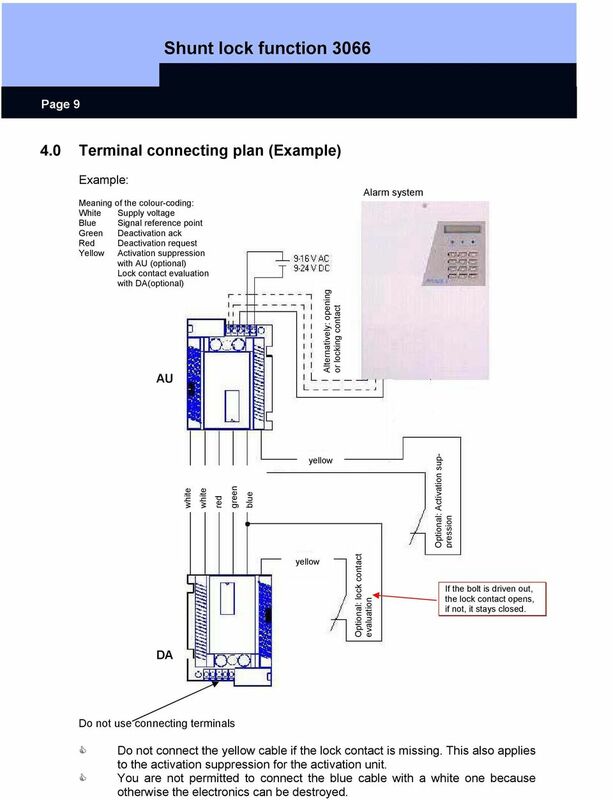 9 Page Terminal connecting plan (Example) Example: Meaning of the colour-coding: White Supply voltage Blue Signal reference point Green Deactivation ack Red Deactivation request Yellow Activation suppression with AU (optional) Lock contact evaluation with DA(optional) AU Alternatively: opening or locking contact Alarm system white white white white red red green green blue blue yellow Optional: Activation suppression yellow Optional: lock contact evaluation If the bolt is driven out, the lock contact opens, if not, it stays closed. DA Do not use connecting terminals Do not connect the yellow cable if the lock contact is missing. This also applies to the activation suppression for the activation unit. You are not permitted to connect the blue cable with a white one because otherwise the electronics can be destroyed. 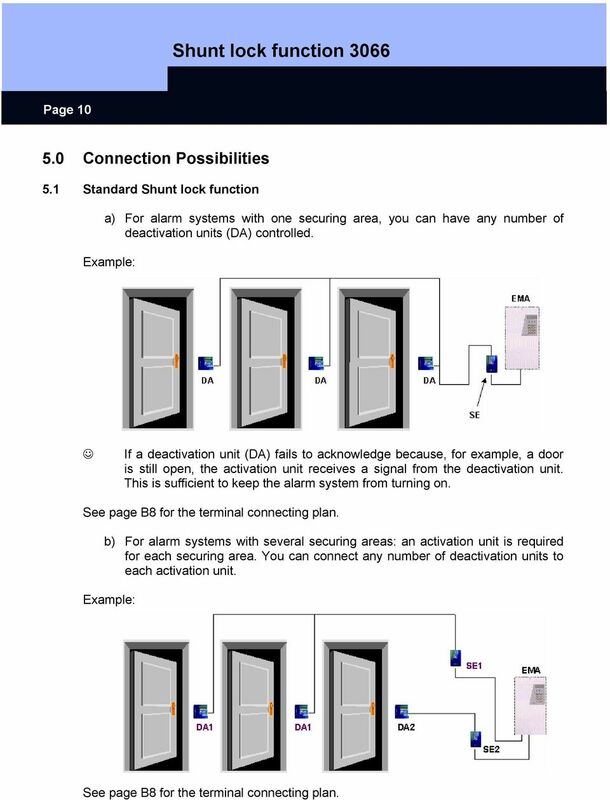 10 Page Connection Possibilities 5.1 Standard Shunt lock function a) For alarm systems with one securing area, you can have any number of deactivation units (DA) controlled. Example: If a deactivation unit (DA) fails to acknowledge because, for example, a door is still open, the activation unit receives a signal from the deactivation unit. This is sufficient to keep the alarm system from turning on. See page B8 for the terminal connecting plan. a) XXXX b) For alarm systems with several securing areas: an activation unit is required for each securing area. You can connect any number of deactivation units to each activation unit. Example: See page B8 for the terminal connecting plan. 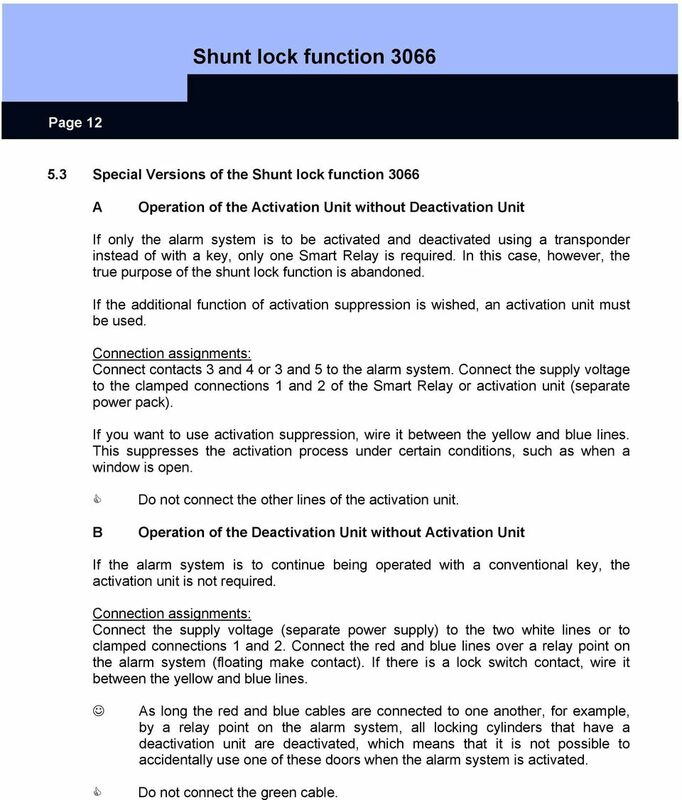 12 Page Special Versions of the Shunt lock function 3066 A Operation of the Activation Unit without Deactivation Unit If only the alarm system is to be activated and deactivated using a transponder instead of with a key, only one Smart Relay is required. In this case, however, the true purpose of the shunt lock function is abandoned. If the additional function of activation suppression is wished, an activation unit must be used. 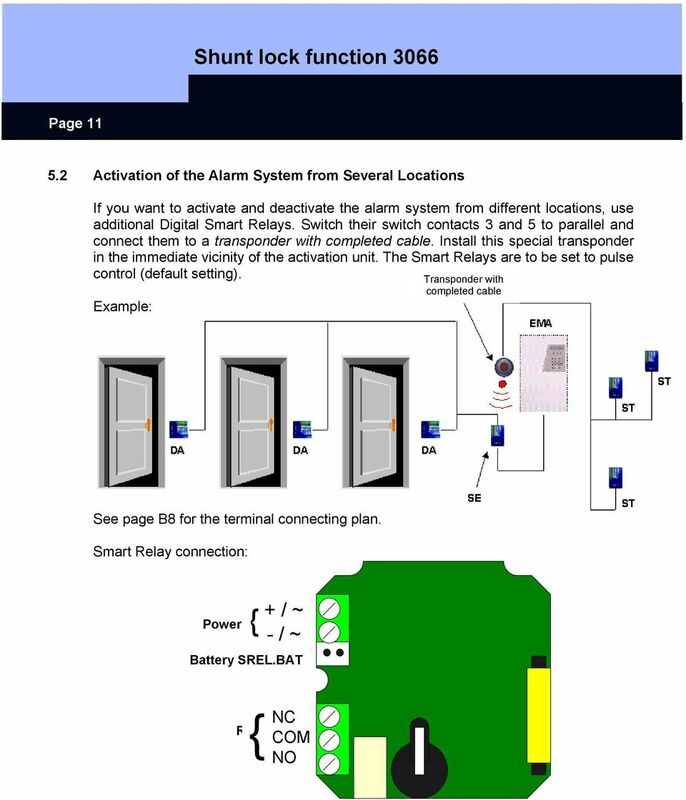 Connection assignments: Connect contacts 3 and 4 or 3 and 5 to the alarm system. Connect the supply voltage to the clamped connections 1 and 2 of the Smart Relay or activation unit (separate power pack). If you want to use activation suppression, wire it between the yellow and blue lines. This suppresses the activation process under certain conditions, such as when a window is open. B Do not connect the other lines of the activation unit. 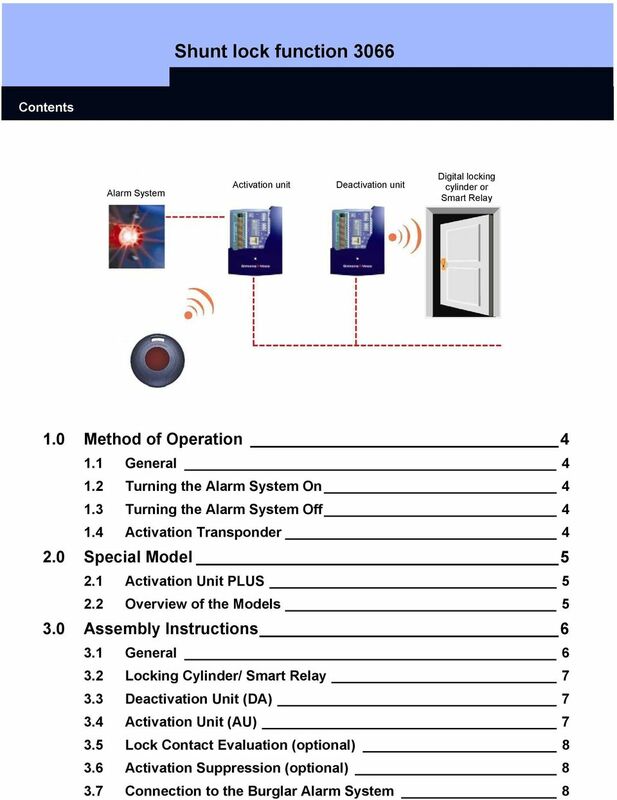 Operation of the Deactivation Unit without Activation Unit If the alarm system is to continue being operated with a conventional key, the activation unit is not required. Connection assignments: Connect the supply voltage (separate power supply) to the two white lines or to clamped connections 1 and 2. Connect the red and blue lines over a relay point on the alarm system (floating make contact). If there is a lock switch contact, wire it between the yellow and blue lines. As long the red and blue cables are connected to one another, for example, by a relay point on the alarm system, all locking cylinders that have a deactivation unit are deactivated, which means that it is not possible to accidentally use one of these doors when the alarm system is activated. Do not connect the green cable. User Manual. Before installation and use, please read the user manual carefully. GSM Alarm System. Installation and Users guide. 1. One-zone alarm system, suitable for office, home, boat and caravan. 48.12. 2 pole, 8 A Safety relay. Screw terminal. 35 mm rail (EN 60715) mounting. 2 CO (DPDT) 8/15 250/400 2,000 500 0.37 8/0.65/0. Compact, rugged housing Many mounting possibilities Status displayed via LED Immune to electromagnetic interference 1024 pulses per revolution (default) 360, 512, 1000, 1024, 2048, 2500, 3600, 4096, parametr. HM-W536 Install Guide 9/13/2013 IMPORTANT SAFETY INSTRUCTIONS Warning - When using electrical devices, basic safety precautions should be followed to reduce the risk of fire, electrical shock or injury. O N DS160/DS161 Installation Guide High Performance Request-to-Exit Sensors 1.0 Description The DS160/161 is a passive-infrared (PIR) detector designed for Request to Exit (REX) interior applications. Installation and operating instructions Digital gear indicator SUZUKI versions: RL, BL LED red, LED blue for SUZUKI: GSXR 600 since year of manufacture 2001 GSXR 750 since y.o.m. 2000 GSXR 1000 since y.o.m. Clear Glass Sensor Optimum Sensor for Detecting Transparent Glass and Plastic Bottles E3S-CR67/62 Retroreflective Sensor smoothly detects 5-mm gaps. Detects transparent bottles that have a lens effect. SA-320 Installation Guide Date: Dec, 2006 Version: 2.0 All Rights Reserved Page 1 TABLE OF CONTENTS 1. Product Overview......3 1.1 Main Features...3 1.2 Applications.....3 1.3 Package Content.....3 2.